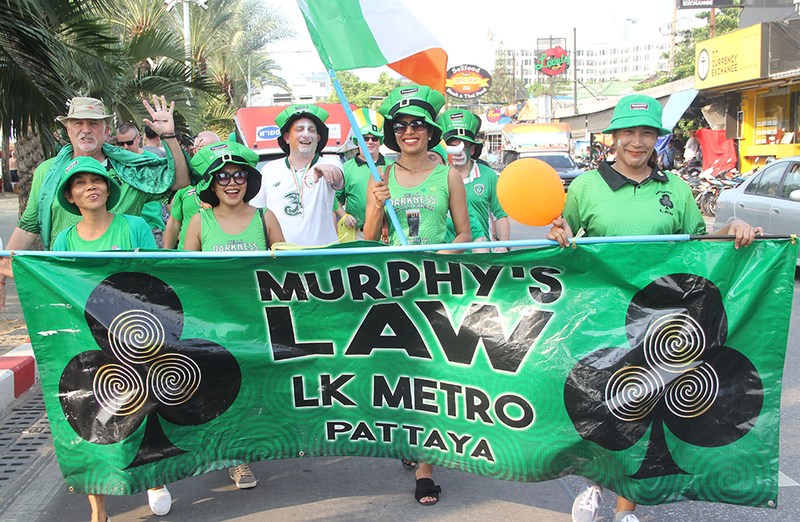 Now in its ninth year, the Pattaya’s St. Patrick’s Day Parade grows in size each year, and 2019 was the biggest ever. 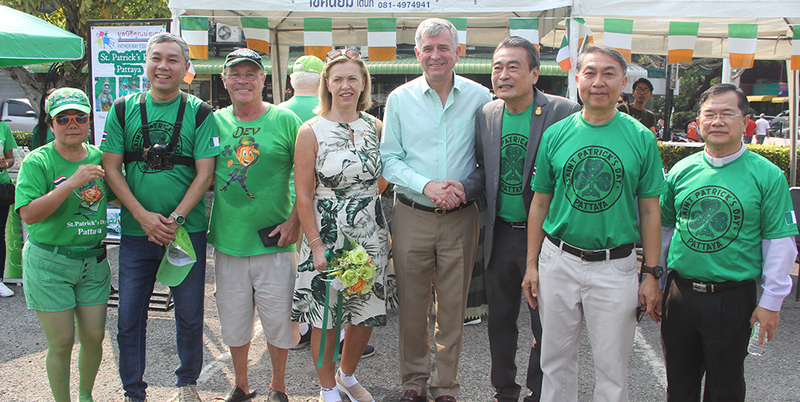 This was the first year that the newly installed Ambassador at the Embassy of Ireland, His Excellency Tony Cotter, together with his wife Marie Cotter, took part in the parade. 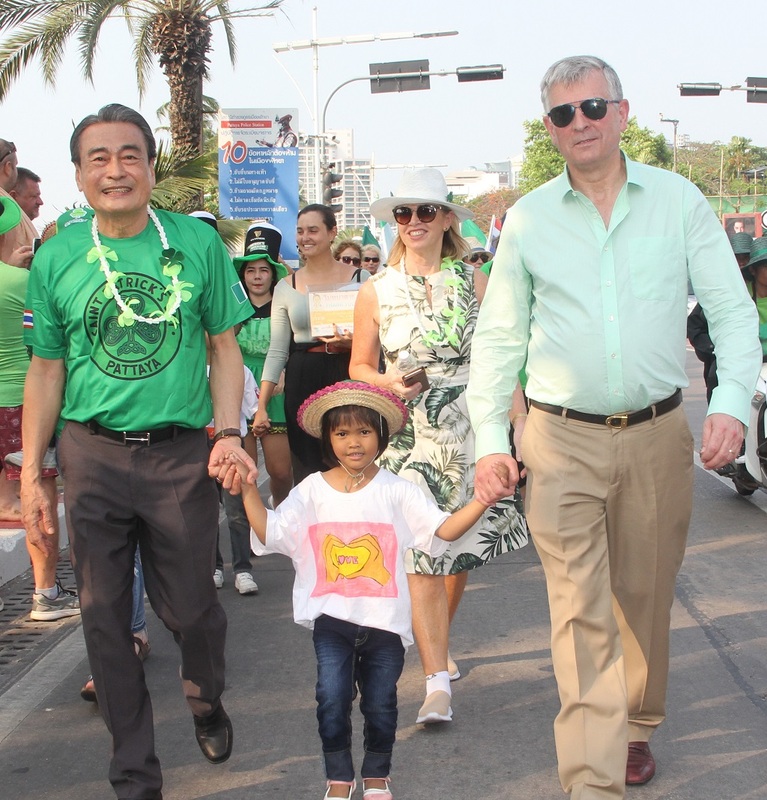 Shown here, Ambassador Cotter, Mrs. Cotter and Deputy Mayor Ronakit Ekasingh march in the parade with a new friend. 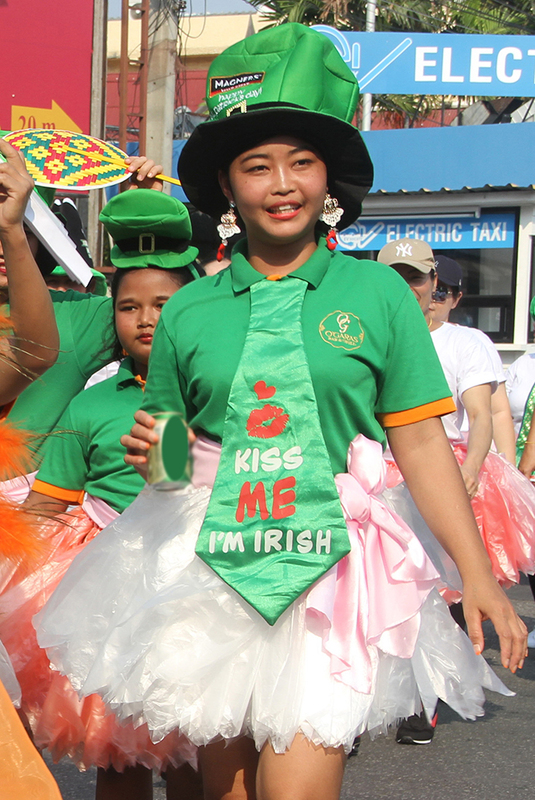 Now in its ninth year, the Pattaya’s St. Patrick’s Day Parade grows in size each year. Taking place on the afternoon of the 17th of March, the weather was overcast, but being Sunday afternoon there were many shoppers and holidaymakers lining the route, which, as it does each year, started at Alcazar Theatre on Second Road, down Soi 4, along Pattaya Beach Road and ended at Pattaya School No. 8. 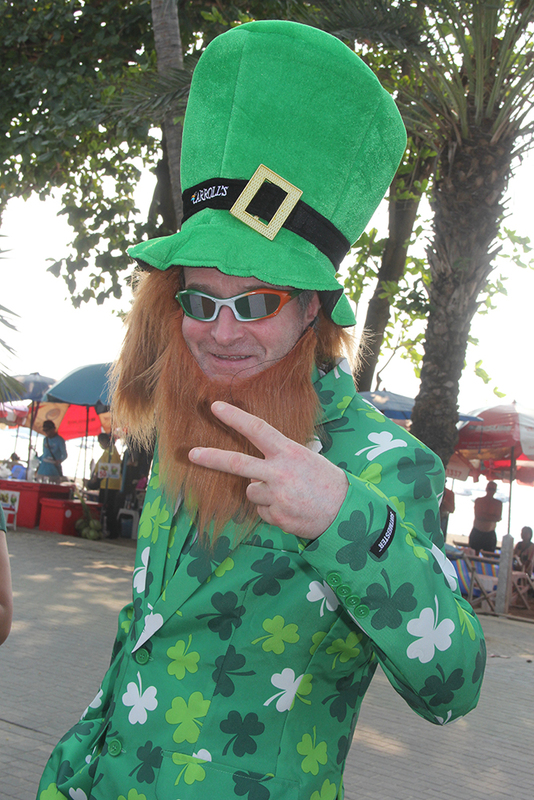 A sea of green, almost a kilometer in length, made its way slowly past the sunbathers on the beach; the sight of elderly and portly men wearing the skimpiest of Speedo-style swimming trunks did bring a smile to the faces of the children parading past. This was the first year that the newly installed Ambassador at the Embassy of Ireland, His Excellency Tony Cotter, together with his wife Marie Cotter, took part in the parade. They were welcomed by Fathers Peter, Sukhum and Michael from the Father Ray Foundation and Deputy Mayor Ronakit Ekasingh. 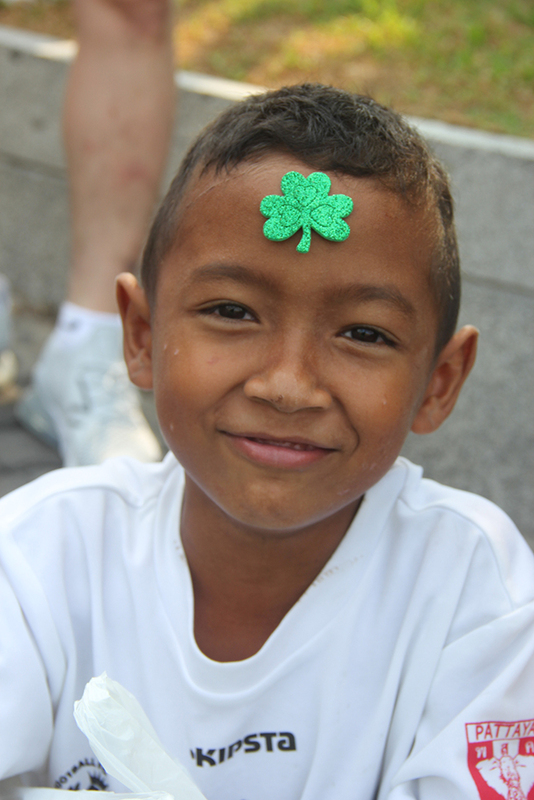 After the official ceremony of raising the national flags and singing the national anthems of Thailand and Ireland, the parade started and was led by the Royal Thai Navy band. 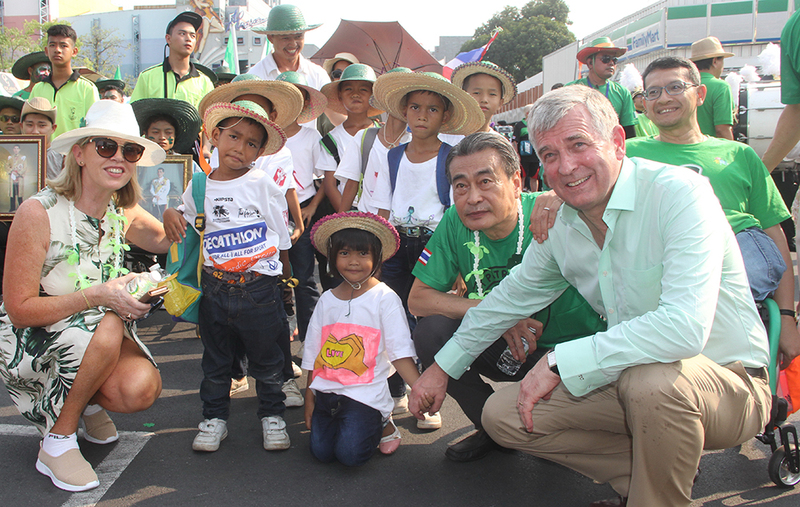 The Ambassador, Mrs. Cotter and Ronakit walked with the children from the Father Ray Children’s Village, while the disabled students followed closely behind, paying tribute to His Majesty the King. 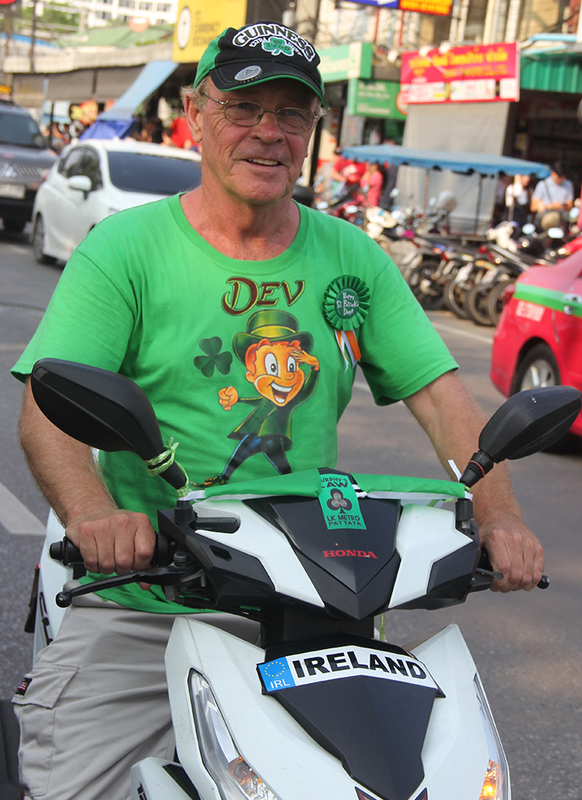 The one thing missing from this year’s parade was that Derrick Kane, founder and originator of the parade, was absent, though we wish him a speedy recovery back to good health. Fathers Peter, Sukhum and Michael and the Deputy Mayor Ronakit Ekasingh welcome the Ambassador and his wife Marie Cotter. Last year they dressed as Star Wars characters, this year Harry Potter. 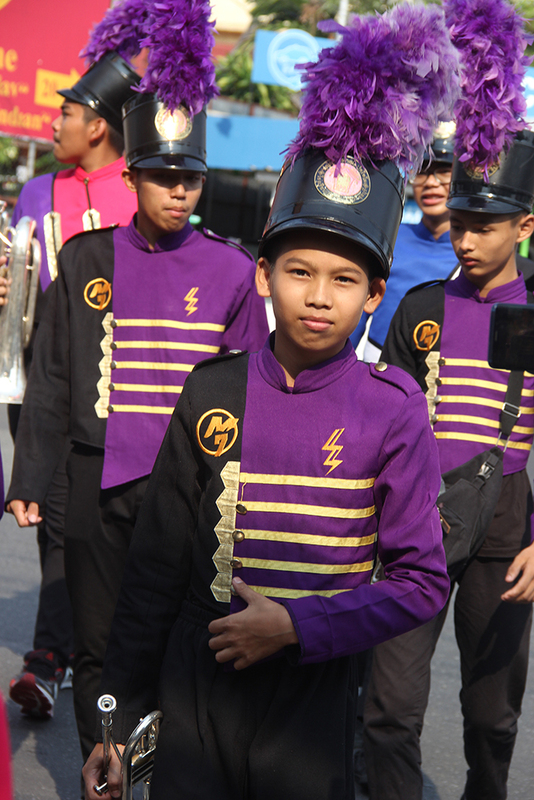 One of four local school marching bands. Steve Devereux, one of the hardworking organisers of the Parade. That’s an invitation you can’t refuse! 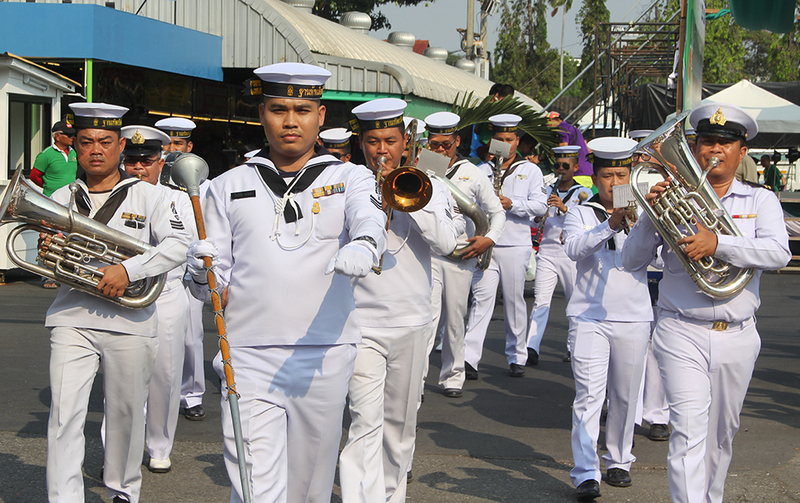 The Royal Thai Navy band.